In the wake of an incident that threatens to tear apart the community in Alexandria, Rick rallies the town to divert a huge herd of walkers that has been massing nearby. Alexandria is attacked by the Wolves, forcing Carol and Morgan to spring into action and defend the town from the insane invaders. Meanwhile Carl tries to protect Enid, and the new town doctor tries to save a life. As Rick races to cut off the herd that is heading straight for Alexandria, Glenn and Michonne lead a group back to help the town -- only to find themselves trapped in a vacant town by the swarm of walkers. Morgan tells the story of his encounter with a man living alone in the remote wilderness, where he learned to put his past behind him and to value all life. The people of Alexandria must deal with the consequences of their isolation when the walker herd besieges the wall. Meanwhile, Aaron agrees to help Maggie escape the city to search for Glenn. An attack on the road separates Daryl from Abraham and Sasha, leading him to an encounter with a trio of young people fleeing an oppressive group. Meanwhile Sasha confronts Abraham about his apparent death wish. Rick and the townspeople begin a difficult recovery following recent events, preparing for future conflicts while the walker herd threatens to compromise the wall. Carol discovers Morgan's secret, and two survivors outside the walls make their way back home. As Alexandria is overrun with walkers Rick and Michonne try to protect Jessie's home, while a despondent Ron makes a move against Carl. Morgan tries to keep Carol away from his prisoner. With Alexandria overrun by walkers, Rick's attempts to lead his loved ones to safety leads to tragic ends. While Glenn and Enid try to rescue Maggie, Denise finds herself at the mercy of an escaped prisoner. Meanwhile Daryl, Sasha, and Abraham encounter an intimidating new group on the road. A hopeful Rick and Daryl make a scavenging run to restock the town's supplies, but run into a competitor who tires to thwart their efforts. 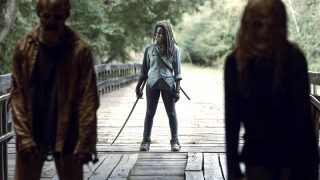 Michonne follows Spencer into the woods, where Enid and Carl also make an unsettling discovery. With the community in need of food Rick agrees to allow Jesus to lead them to a neighboring community called Hilltop, where they quickly see that their potential allies have problems of their own. Meanwhile Maggie is called upon to negotiate with the local leader, and Abe reconsiders his romantic options. Alexandria prepares to make an assault on Negan's compound in order to secure their new arrangement and secure a more lasting peace. Meanwhile Carol wrestles with the things she has had to do, and Abraham makes a change. Carol and Maggie are captured following the group's assault on the Saviors' stronghold, forcing Rick to try and negotiate for their release. Inside the enemy hold-out, Carol tries to get inside the minds of her captors. Denise convinces Daryl and Rosita to take her on a run to an apothecary, hoping to prove to herself that she can handle herself in the new world. Meanwhile Eugene and Abraham take their own excursion, and Carol makes a fateful decision. Desperate to get Maggie medical help at Hilltop, Rick ventures out with a group in the RV only to find themselves blocked by the Saviors at every turn -- drawing them into a face-to-face confrontation with Negan himself. Elsewhere, Morgan tries to convince Carol to return to her friends in Alexandria.